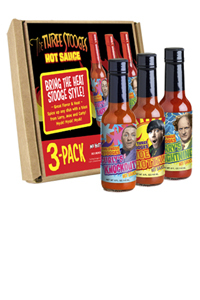 The Three Stooges Hot Sauce gift pack includes the three collectable hot sauces from Moe, Curly and Larry. Packed in a great looking collector pack, these 3 hot sauces range in heat and flavor from Garlic Habanero, Habanero and Cayenne! It is a great gift for Stooge fans everywhere!! Bought the set as kind of gag gift for my son. He's a big fan of The Three Stooges and hot sauce. He said they were actually really good.